The temple complex at Dendera is quite large, boasting a basilica, two birth houses, a sacred lake, and numerous other temples and shrines within its walls. Structures at the site hail from an assortment of different ancient Egyptian eras, with monuments from the Middle Kingdom, the Ptolemaic Era, and the period of Roman provincial rule. There is evidence that the first building on the site went up around 2250 BCE, but the standing structures mostly date from the Ptolemaic era forward. In 1995 BCE, construction likely began on the Mentuhotep II monument, the oldest existing structure when the site was rediscovered. The Mentuhotep monument has since been moved to Cairo. The oldest structure currently there is from Nectanebo II, built ca. 345 BCE. All that said, it may be more accurate to say the structure as we know it began in 54 BCE, when construction began on the Temple of Hathor, the most prominent structure at the Dendera complex. The Temple of Hathor is one of the most well-preserved antiquity sites in Egypt today, and is an excellent example of traditional Pharaonic architecture. The Temple of Hathor was built primarily during the Ptolemaic Dynasty, which was a period of Greek rule in Egypt. However, construction of the temple was completed under the Roman emperor Trajan, who is seen depicted on the walls of the complex making offerings to Hathor. The temple complex also includes a monumental gateway, constructed by Trajan as well as Domitian, another Roman emperor. This site was a center of the cult of Hathor. It was believed that during a period known as the Happy Reunion, Hathor would journey from her temple at Dendera to spend some time with her husband, Horus, at his temple in Edfu. This “reunion” was a yearly occurrence, and at the end of the celebration, the return of Hathor to Dendera was thought to signal the official beginning of the flood season of the Nile. 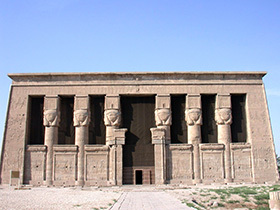 The temple originally housed the famous Zodiac of Dendera. This bas-relief with human and animal figures represented a night skyscape, and was found on the ceiling of a chapel in the Temple of Hathor, where the mysteries of the resurrection of the god Osiris were celebrated. Egyptologists determined it should be interpreted as a map of the sky rather than a giant horoscope or a perpetual astrological tool. The particular configuration of the planets among the constellations shown in the Zodiac of Dendera occurs only about once every thousand years. Two astrophysicists have dated it to between June 15 and August 15, 50 BCE. Two eclipses are represented on the Zodiac exactly where they occurred at that time. The representations of the signs of the zodiac as we know them today did not appear in Egypt until the Greco-Roman Period. This monument reflects the way Egyptian cultural elements merged with Babylonian and Greek astronomical and astrological theories, as a result of the Assyrian and Babylonian deportations of the eighth and sixth centuries BCE, and the Persian and Greek invasions of the sixth and fourth centuries BCE. The Zodiac of Dendera was transported to France in 1821, with the permission of Mohamed Ali Pasha, who was the Turkish viceroy of Egypt at the time. The Egyptian government has asked for its return. It currently is on display at the Louvre in Paris. Image: The Temple of Hathor at Dendera. Taken by the Rosicrucian Egyptian Museum. Shaw, Ian. The Oxford History of Ancient Egypt. Oxford University Press, New York, 2000.